Early in the 19th century the heterogeneous society of the Ottoman Empire did not have regulated musical and concert life yet; there were no professional composers and performers. In the musical culture orally transferred folk and gusan (вЂњminstrelвЂќ) music was dominating. 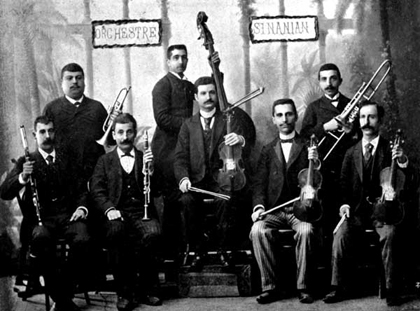 The first Western Armenian musical bands were established in the beginning of the 19th century by composer and director Karapet Papazyan, who was the organizer and head of the first Armenian theatrical orchestra in Constantinople. He had such a prominent role in the musical life of Constantinople that he was frequently being invited to direct orchestras composed of European musicians during the European-style performances. Thanks to PapazyanвЂ™s activity the role of the musical art considerably increased in the Ottoman, especially in Western ArmeniansвЂ™ societies. The demand for the dissemination of musical knowledge brought about the establishment of musical periodicals. The first among them was вЂњArevelean knarвЂќ (Oriental lyre) periodical, which was published in 1858. This step was of historical significance, as it was the first musical periodical with European musical notation system published in the Ottoman Empire. It marked the beginning of the spread of European notation system in the Ottoman Empire. Since 1861 вЂњKnar haykakanвЂќ (Armenian lyre) journal started to be published, followed by a homonymous musical organization founded in 1862 in Constantinople. In 1875 Nikoghos Tashjyan and his brother Hakob Tashjyan began publishing вЂњNvagk osmaneanвЂќ (Ottoman Tunes) the semi-annual newspaper disseminating oriental tunes adapted for piano and other musical instruments. The earliest operettas, operas, as well as musical theatres came into being in Constantinople by the efforts of Western Armenians. Those were the first throughout the Middle East and were of historic significance. Among those who propagated them was T. Chukhajyan, who had had a special role in that devoted work. The Armenian composer T. Chukhajyan, who had received education in Italy, was one of the first composers of the Ottoman Empire, who had command of such difficult genres as symphonic, chamber and opera music, different forms of polyphony, as well as the orchestra notation. Referring to the significance of ChukhajyanвЂ™s activity in Turkish musical culture, Muhmud Rahib mentioned that he was the first composer, who tried to bring Turkish music close to the European art. 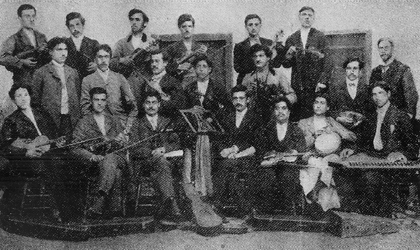 The activity of musical life contributed to the establishment of musical groups in Western Armenia and in places of the Ottoman Empire with large Armenian population. 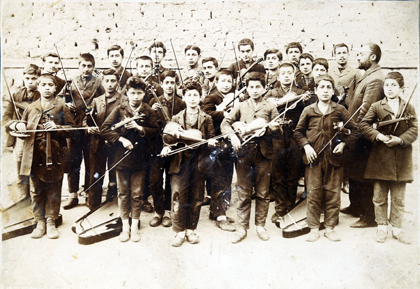 Music became a compulsory subject in the Armenian schools, thanks to which many talented musicians were revealed. Among the Western Armenians there were not only musicians, performers, composers and pedagogues, but also famous masters making musical instruments. Special attention deserves Master Qerovbe Ziljyan (1830-1910), who had his own factory of cymbals and enjoyed great fame in the whole World. His cymbals exceeded the European ones in their quality, mildness of sound and durability. The Ziljyan cymbals were represented in many world exhibitions and won many awards. The Armenian music art suffered tremendous losses during the Armenian genocide organized and perpetrated by the Young Turks Government in the years of World War I. 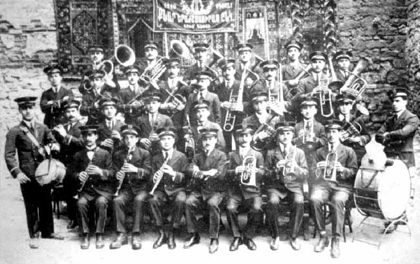 Many renowned musicians were fell victim to the genocide and music bands had to be disbanded. 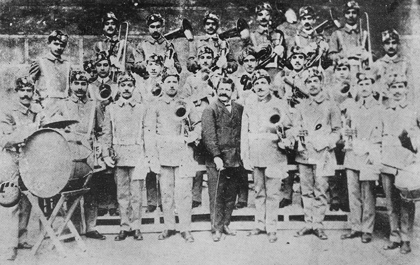 The musical band of Sanasaryan College in Karin (Erzerum), 1911. 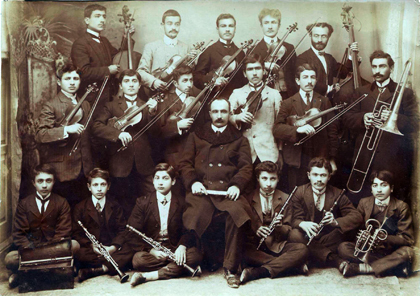 H. TutunjyanвЂ™s group of violinists, Western Armenia, Konia, 1900s. 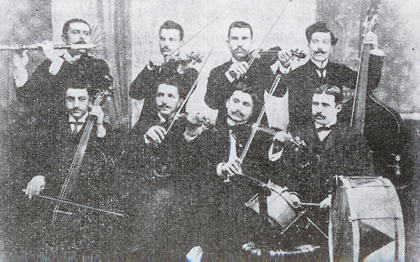 A group of violinists in Western Armenia, 1900s. 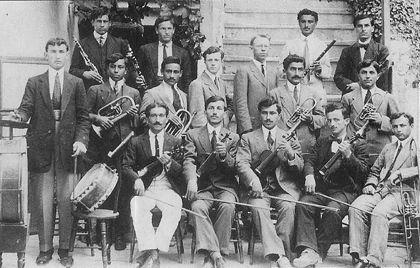 The musical band "Shehir" in Sivas, 1900s. 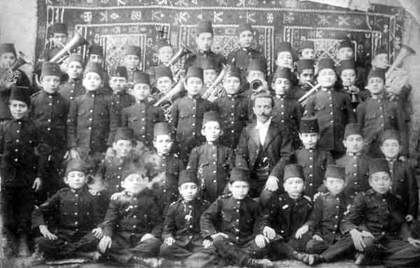 The musical band of the Armenian Yesayan Orphanage in Pera, 1900s. 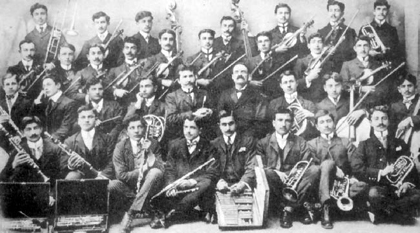 A group of Armenian trumpeters in Aintab, early 20th century. 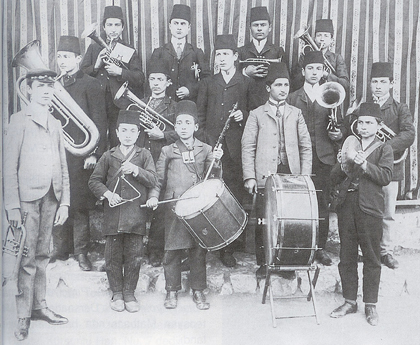 The Armenian musical band "Toni" in Samatia, early 20th century. 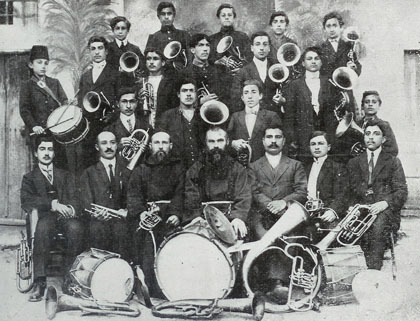 The Armenian musical band of Aintab, early 20th century . 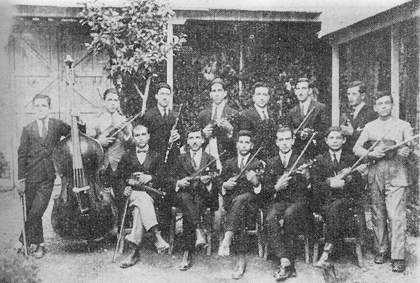 A group of Armenian violinists of the French College in Kharberd 1914. 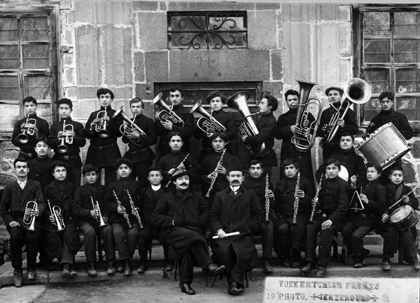 A group of Armenian trumpeters of the French College in Kharbert, 1900s. 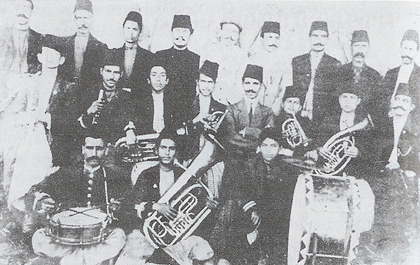 The musical band of Euphrates College in Kharberd 1880-1910. 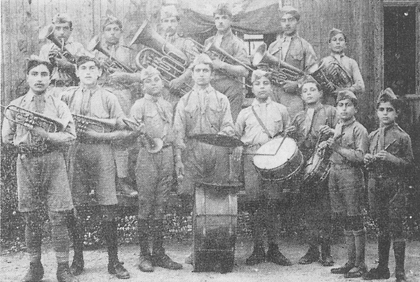 The scout musical band of Adana, 1920. 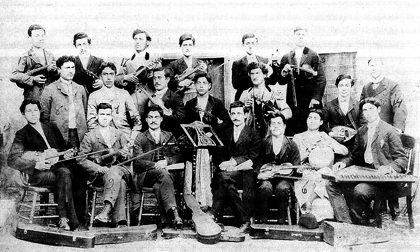 The Armenian musical band of Adana, 1920-1921. 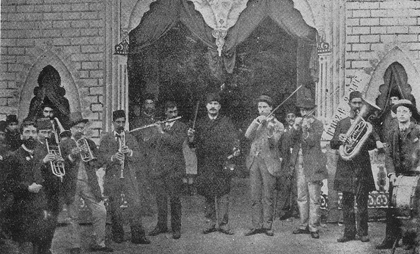 The Armenian musical band of Adana, 1902-1906. 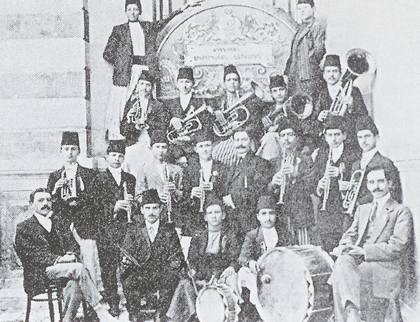 The musical band вЂњРљnarвЂќ of Smyrna, 1909. 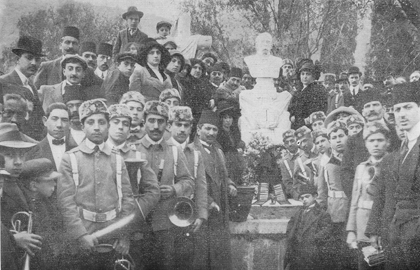 The Penklyan Company of actors and the musical band вЂњРљnarвЂќ in front of the memorial of Tigran Chukhajyan, 1912. 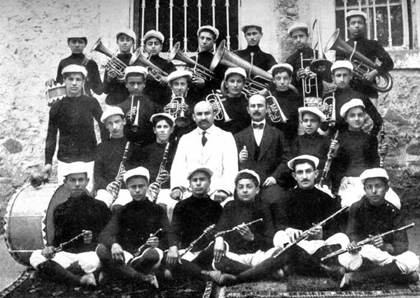 A group of Armenian trumpeters with teachers of French St. Barbara College in Izmit, 1912. 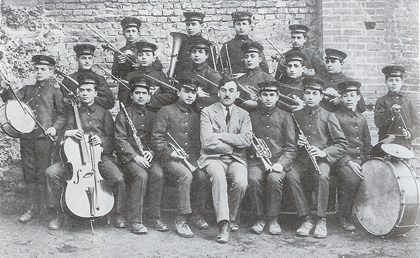 A group of Armenian trumpeters of French St. Barbara College in Izmit, 1912. 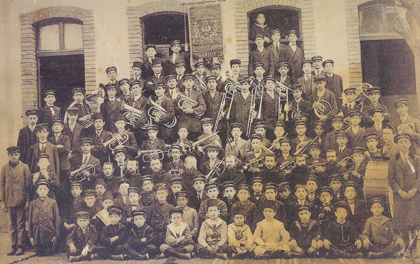 The musical band of the Armenian College in Mezreh, 1900s. 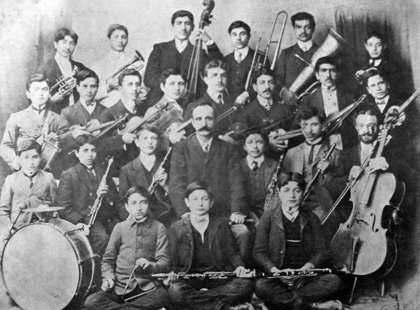 The musical band of "Anatolia" College in Marzvan, 1909-1910. 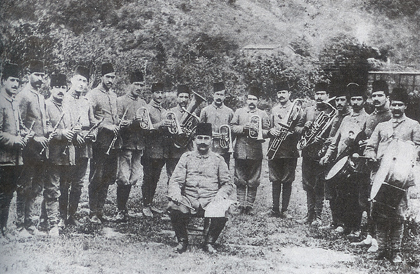 A group of Armenian trumpeters in Bilejik, 1911. 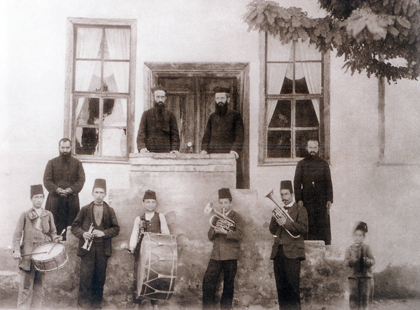 The Armenian musical band "Knar" in Gum Gapu, 1910. 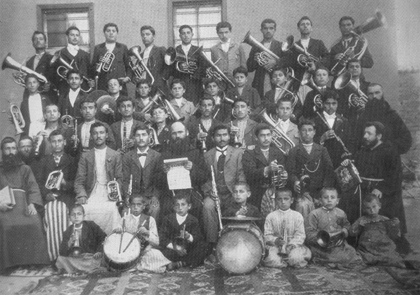 A group of trumpeters of the Armenian College in Amasia at the end of 1890s and the beginning of 1900s. 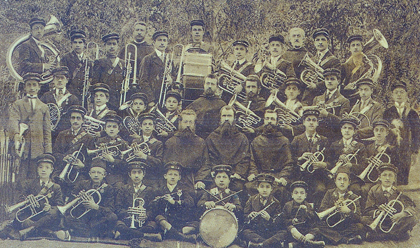 The musical band of Saint Paul College in Tarson, 1914. From left to right: Hovhannes Qeolian, Harutyun Teyirmenjyan, V. Petelyan, Yervand Naggashyan, Petros Taragjyan (sitting). 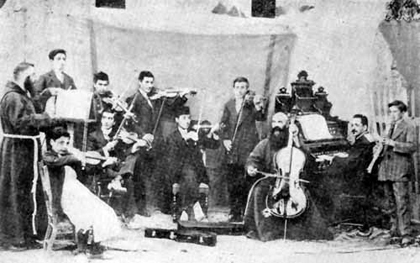 From left to right Levon Nikoghosyan, unknown, Y. Mkrtichyan, musician Pier Priqe, teacher Pol Nilson, Martiros Sargisyan, Teotor Hempeqitis (standing).